1. Define the Internet, Intranet, and e-commerce. Write a note on e-commerce. What are the advantages of e-commerce over conventional business? Ans. : Over the past decade, no innovation has impacted the way individuals and businesses communicate as dramatically as networking technologies. These technologies have enabled the low-cost development of open, interactive environments that help to break down the traditional barriers to strong business relationships. Many organizations are just discovering that the 'Internet and World-Wide Web (Web) offer an unparalleled opportunity for gaining competitive advantage in the global marketplace' (Cronin 1996). The Internet is currently one of the most significant infrastructures in business. Its capacity for gathering information and the dissemination thereof is 'unsurpassed by any other current system in the world' (Van As 1998:4). For businesses, the Internet offers an excellent means to compete globally with other businesses of differing sizes. Now businesses in South Africa have the ability to market themselves in the global marketplace. For many reasons, the Internet and Web is becoming a main arena for the business community worldwide. The Internet is both an enabling tool for business and the new business environment that is transforming the economy. According to Gascoyne and Ozcubukcu (1997:11), the Internet is the most global, borderless, cost-effective and open business application and communication infrastructure. Interactions and relationships between businesses and their customers have changed due to the Internet, as the Internet now allows customers many more choices. The Internet has enabled businesses to change their strategic objectives. And 'for successful companies, the Internet is not about technology; it’s about the customer. Successful companies' Internet strategies are to deliver more value to the customer' (Gascoyne and Ozcubukcu 1997:11). The Internet's connective network enables organizations to establish closer links with not only their customers, but also with suppliers, partners, etc. by using intranets and extranets. It is only natural, with the advent of Internet technology throughout the world that business should begin to use these networking facilities for both internal communication and with those outside the organization. Electronic commerce is the latest economic profiteer for businesses who have recognized this advent. Cisco Systems is one company that has realized this and is in the process of establishing an intranet and extranet for the facilitation of improved e-commerce within the company. The company aims to be a more effective information distributor and allows employees a continuous and up-to-date means of attaining information, thus enabling continuous relationships with customers and partners. 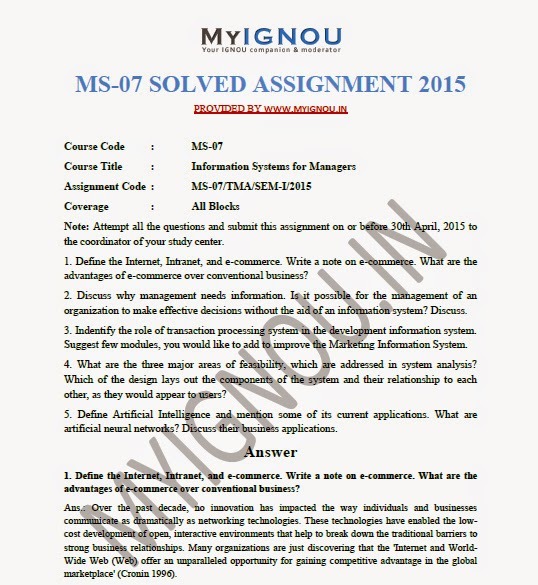 Share "Download MS-07 Solved Assignment 2015"
Share this page (Download MS-07 Solved Assignment 2015) to let others know about it! plz upload ms21 Assignment 2015.plz help.